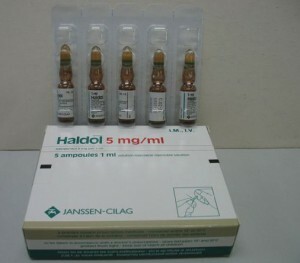 Haldol is the brand name for the generic drug Haloperidol and is a conventional antipsychotic used to treat patients who suffer from mental disorders, personality disorders, motor and verbal tics and other problems including schizophrenia, acute psychosis, Tourette’s syndrome, and bipolar disorder. Haldol is available as tablets, oral solution and injectable solution. It has been developed by Janssen and was later traded in the USA by McNeil Laboratories. Haldol is a butyrophenone derivative that works by blocking the dopamine receptors in the brain. It essentially works to calm abnormal excitement activity within the brain. It is sometimes used for the elderly who suffer from the early stages of dementia. Because it is an antipsychotic, it has been known to cause rapid mood changes in patients who are consuming the drug. Haldol is distributed by prescription only, and comes in the form of a tablet and/or concentrated liquid that is taken orally. It is usually consumed anywhere from two to three times per day, and is most effective if consumption occurs at the same time every day, as well. Haldol is used for the treatment of schizophrenia, acute affective disorders such as manic episodes, delirium tremens (an acute condition caused by withdrawal from alcohol) and other psychiatric conditions associated with delusions, hallucinations, paranoa and aggitation. It is also used in the treatment of Tourette syndrome, tics and persistent hiccups. Haldol has a strong antiemetic effect so it is a possible therapeutic choice when strong uncontrollable vomiting is present. Due to its quick effect, injectable Haldol is often used for coping with different emergencies connected with severe aggitation. Inform your doctor about any other prescription, OTC medicines, herbs or dietary supplements that you are taking. are allergic to haloperidol, other similar drugs or any of the other ingredients of the medicine. have any kind of arrhythmia or you are treated for arrhythmia(abnormal heart rhythm). Haldol is not administered to patients in coma or suffering from drowsiness, delayed reactions or suppressed breathing. Haldol should not be given to children under 3 years of age. there is a case of sudden cardiac death in your family or arrhythmia. you have low electrolyte blood levels. you have a history of brain bleeding or any other risk factors for stroke. Patients having epilepsy or other kind of seizures may need a dose adjustment of their medicines. Inform your doctor if you are suffering from any other serious medical conditions. If you have to undergo a surgery or dental procedure, inform the doctor that you are on Haldol. Avoid intensive sunlight exposure or use sun protection during the treatment. Haldol should be avoided or administered very cautiously to people with a history of alcohol abuse. If you notice any unusual symptoms during the treatment such as fever, blood pressure changes, muscle rigidity or confusion, call the health emergency services immediately. Patients should be closely monitored during the treatment as dose changes may be necessary. Avoid driving motor vehicles or operating machinery. Haldol should be discontinued gradually under strict medial control.